A makeover gone wrong and now the viral video that highlights its insensitivity in dealing with passengers, Air India is facing severe turbulence on social media. The cash-strapped national carrier was taken by surprise when a video showing a passenger, due to give her exam the following day, pleading with Air India staffers as they refuse to allow her to board the flight as she was five minutes late, had gone viral. The passenger who arrived at the T2 international terminal of the Chatrapati Shivaji International Airport (CSIA) for a Mumbai-Delhi flight can be seen justifying her reason for late check-in by saying that “they had received wrong information from a travel website’s message”. The video was uploaded on Valentine’s Day by another passenger Shivendra Namdeo. It being a weekend and with fans busy supporting India-Pakistan World Cup cricket match, the video started gaining attention only at the start of the week. Initially picked up by online portals, later the video became a talking point on almost every portal. As of today the video has fetched more than 1.3M views on Facebook, Namdeo’s Facebook post has been shared more than 50,000 times. 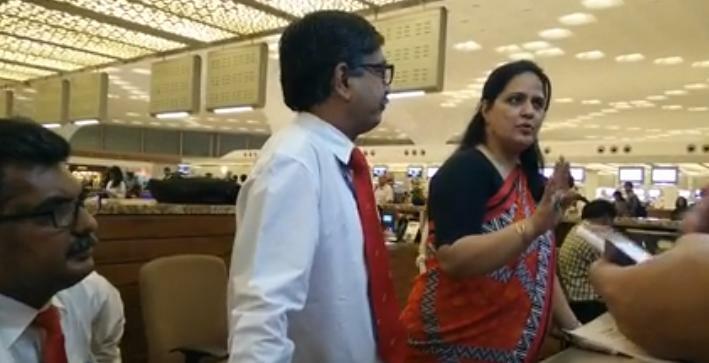 To battle the negative sentiments on social media, Air India posted two tweets about the video on the 17th stating that it is distressed at the video that shows its staff in poor light and that the matter is being examined. However, the carrier had no response for the customer grievance. Clearly Air India was once again caught napping under a poor communication strategy. “Well, there was some fire, hence the smoke. Not sure who was at fault here, but clearly in this age of instant communications that sets the narrative for public perception of a company/service/person; Air India should have foreseen the outcome and planned a better communications strategy to counter this (even if they are not at fault),” added Dilip Cherian, Image Guru at Perfect Relations. According to norms at Mumbai airport for Air India flights, check-in for passengers on international flights or flights that are a part of the domestic leg of an international flight from T2 terminal halts 60 minutes before the departure of the flight. For domestic flights from T1 terminal, the check-in counter is closed 45 minutes before the departure of the flight. Post that there has been no update from Air India on the issue, it’s been a week and the carrier is yet to update its customers. “Quick reaction, assurance, and clear message are attributes every brand should develop during crisis. In this case, Air India’s negligent approach to a communications crisis is telling. Considering we have had many past examples of customer dissatisfaction or anger denting brand image on social media, one would have expected the airline to be prepared for such an eventuality,” added Dilip. In 2015 Air India is still thinking public memory is short-term and customers shouting on social media would forget with time. Meanwhile it is busy re-tweeting all the positive flight experiences tweeted by travelers, supporting Indian cricket team and playing contests on social media. The services industry is always challenged by customer expectations. But ignoring conversations and doing a lip service by posting a tweet won’t stop negative sentiments circulating on the Internet. This applies to all carriers and not just Air India. “Indian airlines are far behind the competition when it comes to real-time customer service and social media engagement — they need to be where their customers are if they want to improve their business,” informed Shubhodeep. Brands like Air India are on social media with a smiling face to play contests and re-tweet positive sentiments. But when it comes to customer service on Twitter they transform into a BPO with automated responses!